My hair's in a constant state of shedding and regrowth, which often means that any ponytail is subject to a halo of fine flyaways by mid-day. The John Frieda Full Repair Touch-up Flyaway Tamer is pretty ingenious for anyone who finds themselves in the same boat. 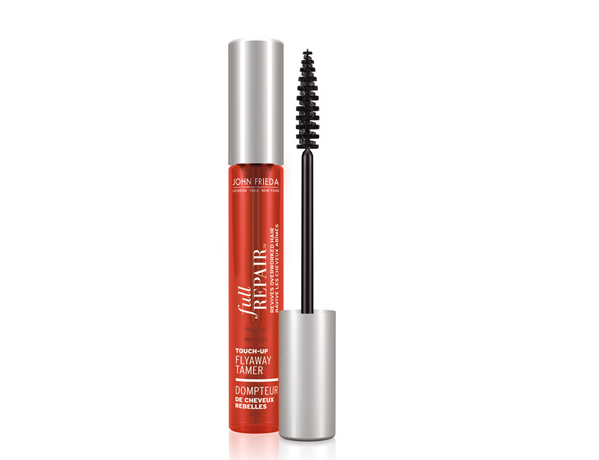 Think of it as a giant clear mascara for your locks. The clear formula, which features Inca Inchi Oil, brushes flyaways in place for a more groomed look and doesn't feel stiff like gel or hairspray. The brush applicator allows for precise application. What's more, the Flyaway Tamer's tube is portable enough to fit in any makeup bag or evening clutch, making touch-ups on the go a cinch. I never even knew this existed! I definitely need it I have so many flyaways after straightening! Isn't it great? Really makes you wonder why someone didn't think of it sooner! hmm interesting, this is the first time I've heard of this!